The nomination is Palin’s to have if she wants it. Thoughtful, articulate on the issues, and presidential - if she can project those on the road it’s hers. 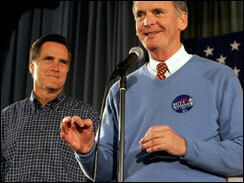 Absent Schmuckabee entering the race, Romney and Pawlenty are her serious opposition. Barbour and Cain are dark horses. Daniels, Gingrich, and others slim-to-noners. 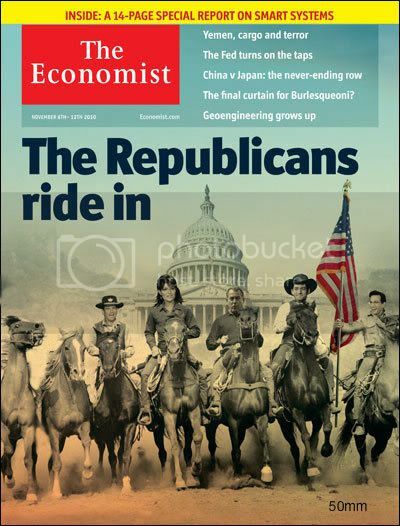 I haven’t decided yet if Bachmann is a stalking horse or not, but don’t underestimate her. If she is, Bachmann could knock Pawlenty, Romney, and Schmuckabee out in Iowa. Palin doesn’t have to win Iowa, just place ahead of P, R, and S. Myth will probably win NH, but if you can water down that victory, all the better. If Pawlenty can’t get mojo ahead of Sarah by NH I think he’s done. I believe he’ll gamble it all on Iowa. I think where Sarah should put a decent portion of her chips is in SC. Barbour might help her there, and if Schmuckabee doesn’t jump in and T-Paw is weak coming out of IA and NH, it becomes a Sarah/Mitt battle real quick with a Barbour/Gingrich/Bachmann/Cain pack, of which I see no more than one breaking out of. Sarah could really get her mojo in SC. Personally if I were Sarah I’d sow more seeds even farther down the line, especially in the Midwest, South, and parts of the West where Myth isn’t as strong. The West could be a real pain in the arse for Sarah and keep Myth in longer than he should. The Schmuck will be also if he stays in, however he might help to knock the Myth out, especially in the West. Sarah needs to get to the front of the pack by SC. The worst scenario here is no clear frontrunners by SC. If not then we are in for a long fight. Don’t put it past Sarah to be a team player either, if she sees another good conservative in the lead, don’t be surprised if she supports that over Myth or Schmuck or Daniels getting it. You know what, guys, I think she can win, and I don’t think that’s a bad thing, because I also think she can beat Teh Awesome. If you really think you can do better, step up, the sooner the better, or stop whining. while using and paying everyone else to attack Gov. Palin. is the leader we need in Washington." "(Fascist, taxaholic, and Truther) Mitt Romney embodies my New Hampshire's values"
This year, the conservative intelligentsia doesnt just tend to dislike Palin  many fear that her rise would represent the triumph of an intellectually empty brand of populism and the death of ideas as an engine of the right. Sounds like it may be time for a true American Party, dump the Reptile rinos, Gregg, McCain, Graham, and the malodorous Left.....2012 may be historic in more than 1 way. some political guru said something in a recent interview whoever runs in this next election will lose against Obama. If they are relatively unknown it will help set them up to win the 2016. If however it is someone who has already run, it would be their death because they wouldn’t be able to win after a third try. I dont see how they think Obama is a shoe in to begin with. if the economy is still dumping he is screwed.